Why not Consider Moving To Vietnam? For those thinking of relocating, there is much to look forward to. Relocating to anywhere in the world is, of course, a big decision. For most, there are family concerns, property in the UK and other factors coming into play. However, if you look at it as a temporary move for a couple of years, the stress becomes less. For most, however, that temporary move is a life changer and one that makes them view the world differently. For many, the country, to which they move, becomes home. If you have not even considered moving to Vietnam, then hopefully you will after reading on. This country has one of the fastest growing economies in the world. For many, thinking of Vietnam conjures up images of a war-ravaged nation. This could not be further from the truth. It is a fascinating country full of business opportunities and one that offers a superb standard of living. Things are very inexpensive here compared to the West, and gaining a position at one of the many major businesses now based here, will give a lifestyle that is out of reach for most people in the West. The country, of course, has the two main powerhouses of Hanoi in the north and Ho Chi Minh City, the former Saigon, in the south. However there are employment opportunities in other parts of the country as well, and no matter what style of living you prefer, moving to Vietnam will provide amazing opportunities for you and your family. For those with children, it is worth noting that 3 years spent in one of the fine international schools here, will on average, put your child about one year ahead of their contemporaries back home. If after reading this you are interested in learning more, visit the RGF Executive Search homepage and get in touch to see what job opportunities are available to you. The country looks set to become a developed nation by 2020. This is a staggering achievement when you look at where the country was just 40 years ago. The foreign investment makes up 22% of the economy here. 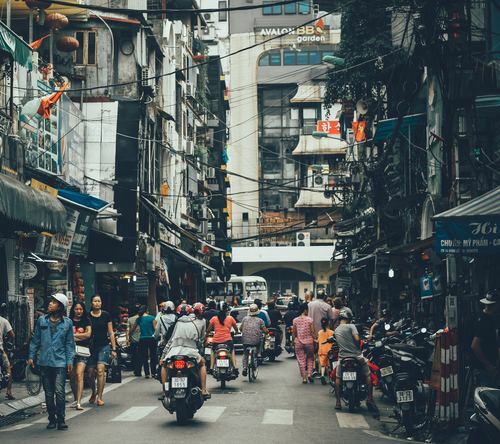 Those thinking of moving to Vietnam will find a very different country to the stereotype often portrayed. English is now the second language here, overtaking France some time ago. The country has a staggering 96% literacy rate among its working population. By 2016 this had become a $60 billion business, with many now predicting that Vietnam will soon overtake India. Whilst Vietnam mainly gets its electricity from coal, hydropower and gas turbines, the government intends to triple renewable energy production by 2030. The geography and climate are perfect for Solar investment with 67% of land deemed suitable. Banking is still currently not as developed as one would hope, but there is high potential in this area. The country is embracing modern technologies. Mobile phone penetration is huge and an openness to accept progress makes Vietnam ripe for the development of cashless banking. Whilst the high-end tourist industry is mainly provided by the huge International brands, The number of smaller three and four-star hotels in the country is extraordinary. Of course, the cities of Hanoi and Ho Chi Minh City account for the largest numbers but increasingly the seaside resorts of Danang, Nha Trang, and Phu Quoc Island are developing rapidly. Main Areas of Production are the Mekong and Red River Deltas for rice and fish, and the cooler temperatures of Dalat for many vegetables. The countryside around Phan Thiet has immense numbers of dragon fruit plantations. Agriculture now makes up 20% of the nation’s exports. Hanoi is, of course, the nation’s capital and the cultural center of Vietnam. It is a city rich in tradition and steeped in historical and artistic heritage. It is also a major player in Southeast Asia’s growing business culture. The city has many superb international schools and businesses here include education, technology, finance, and business advisory services. Hanoi enjoys a mixed climate with distinct seasons. The Old Quarter is the main area for bars, restaurants, and cafes. Arts and crafts feature highly in Hanoi. The huge sprawling metropolis of Ho Chi Minh City offers much for westerners thinking of moving to Vietnam. With large expat communities in the fashionable Districts 2 and 7, newcomers here get the choice of living Eastern style or enjoying a much more familiar Western existence. There is a huge number of international schools here. Business sectors include education, furniture, footwear, engineering, technology, and finance. There is an abundance of museums, art galleries and interesting places to visit. The hotel sector here is the largest in the country. Is the main seaside resort of the country. The situation on the coast in the Central Coastal Region, it is a very pleasant place to be. Those moving to Vietnam who chose to live here enjoy a good lifestyle with great air quality and a vibrant social life. An influx of Russian money into the city has seen big changes in recent years. Again the hotel and tourism areas of business are good and F&B is growing rapidly. Phan Thiet s a busy port town in the Southern Coastal Region of the country, and the capital of Binh Thuan Province. The economy relies heavily on fishing and the manufacture of fish sauce. Tourism here is vibrant and many are drawn to nearby Mui Ne for the Wind Surfing. The two areas of Sand dunes here, The Red Dunes and the White dunes are very popular. The area benefits from its own microclimate and has little rainfall each year. The beautiful island of Phu Quoc is closer to Cambodia than Vietnam and offers some amazing beaches and high-end resorts, many of which have sprung up in the last few years. It’s only a one-hour flight from Ho Chi Minh City making it a very popular weekend getaway. Many of the expats moving to Vietnam, visit the island at regular intervals to relax and recharge the batteries. The island has grown enormously in the last 5 years. Dalat is unlike anywhere else in Vietnam. It is high in the Central Highlands making it much cooler than the rest of the country. Most of the country’s temperate crops are grown here. The city is also famous for flower growing. This beautiful city is the chosen venue for many Vietnamese honeymooning couples. To find out more detail on this cities and tourist spots in the country take a look at the Inseasia website. This article will hopefully give you some idea of just what is available if you are considering moving to Vietnam. It is the country of great variety, amazing people and wonderful scenery. It offers everything from large cities, to seaside towns, great beaches and wonderful trekking in the northern areas around Sapa. The countryside is stunning and the entertainment in the cities is vibrant. This is a wonderful country growing at a truly amazing rate. Contact us at RGF Executive Search to find out more about the terrific opportunities that await.